But, you might recall a negative experience you had while completing a website form. Whether it was an extremely long form, a form that was hard to locate on a company’s website, or one that simply wouldn’t allow you to submit your responses for unknown reasons, most internet users can remember a time in which they had some type of issue completing a web form. Lead generation forms are crucial to your business — they’re how you attract website visitors and turn them into leads. You can’t afford to have a form on your website that doesn’t create a positive, painless experience for those visitors. That’s why we’ve rounded up 22 of our favorite lead generation forms and included key takeaways from each to help you create a great user experience and increase your own conversions. While reviewing the following examples, be sure to keep an eye out for themes — many of these forms employ common, effective tactics that you can apply to your own. Slack keeps things simple with their multi-step lead generation form. The form asks for an email address before taking you to another landing page to complete a few more necessary fields. Slack’s lead generation form also matches their brand’s aesthetic and includes fun animations that don’t distract you from completing the form. Dropbox’s lead generation form appears when you click on the CTA button located on the company’s landing page. There are only four required fields and the form allows you to speed up the completion process by giving you the option to sign in using your Google account. There’s a bright and bold “Get Started” CTA button in the top right corner of Optimizely’s landing page. When you click it, their lead generation form appears in a popup box (along with a dimmed background, making the form easy to read and complete). The two-column format also makes the form appear shorter. Sentient Ascend’s CTA button is pretty much the first thing you see when you go to the company’s website — it’s bright orange and located in the hero section of the page. The form clearly marks which fields are and are not required for you to complete, and there is an optional long-text entry field where you can leave a longer response. The HubSpot Marketing Grader homepage has a unique CTA — it’s a jump link that, when clicked, scrolls down to the bottom of the page where the lead generation form is located. This prevents you from having to search around the website for the form. The form is clean, contains no distractions, includes form field titles that are easy to understand, and tells you what information is required. 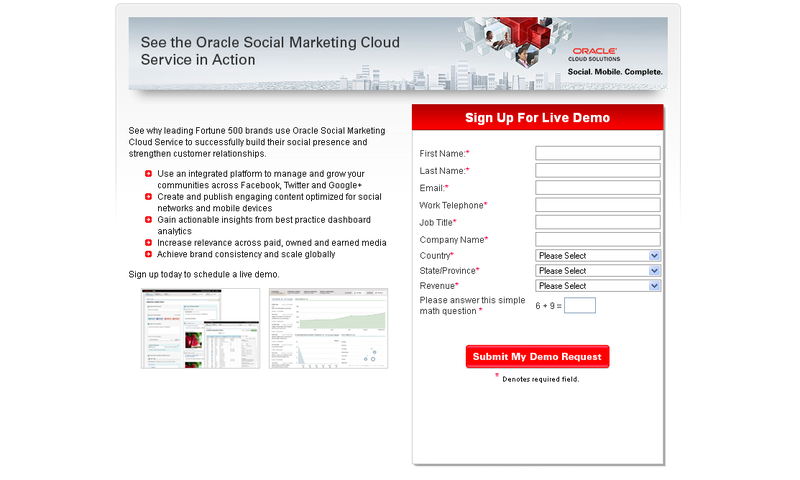 Oracle’s lead generation form is unique because it includes a description about the reasons why so many impressive companies already use their product. They use social proof as a way to entice you to sign up. The form fields are to the side of the product description, which clearly separates the two sections of the page. There is also an asterisk next to each required field to avoid confusion about what information needs to be submitted. Oracle also added a simple math question at the end of the form to ensure only humans are signing up (which works in a similar way to a CAPTCHA). eHarmony’s lead generation form is the first thing you see when you enter the site. The form states that signup is free, which is an added incentive considering eHarmony is a paid dating service. The unique form design — which includes colorful circles that act as checkboxes — is visually pleasing and fits the company’s branding. With only five form fields, sign up is a quick and painless process for visitors. The Microsoft Small Business Academy lead generation form lists multiple reasons why you should register for their webcast — located right next to their lead generation form. Not only do they mention what registration includes, but they also add to the excitement with short bios about the webcast’s featured guests. The form is set apart from the other content on the page as it is located in a separate box, making everything on the page easy to read and the form easy to complete. The Lyft lead generation form is just about the only thing you see (along with some fun animations) when you enter the company’s website. The form serves two purposes — you can either sign up for a ride or apply to become a driver. With the click of a button, the form changes back and forth between these two options. Lyft also makes signing up appear simple by only requiring one piece of information to get started. When you open Airbnb’s website and click on their sign up CTA, you are brought to the form pictured above. The form allows you to sign up using your Facebook or Google account to speed up the process. When they created their form, Airbnb assumed you may have questions come up during the signup process. Located next to specific form fields, there are buttons with question marks that explain why Airbnb requires certain information. Airbnb also confirms whether or not you want to receive their marketing messages via email before simply signing you up. Bizness Apps’ lead generation form is very plain in terms of design, which works because it matches the rest of their branding. The title of the form clearly states its purpose and there is also a reCAPTCHA at the bottom of the form which allows only quality leads (not spammers) to submit for processing. SoulCycle’s lead generation form is located at the top of their landing page in a drop-down menu. The form only requires an email, username, and password, making the entire sign up process take only seconds to complete. In addition to having just a few fields, the form’s sleek look matches SoulCycle’s entire website design and branding. Unico Nutrition has two lead generation forms on their website that appear at different times throughout the buyer’s journey. The first form appears in a popup box the second you open their website. The form offers an incentive for providing your email addresses — an exclusive first-time shopper discount. Who doesn’t love a discount code? Unico’s second lead generation form appears after visitors click a “Sign Up” CTA button. The landing page has a dual purpose and includes two forms — a new customer sign up form and a current customer login form. Whether it’s your first time trying to login or your hundredth, all of your interactions with your Unico account will originate from the same landing page. Lastly, the appearance of both forms matches Unico’s fun and colorful website and branding. Leadformly’s lead generation form provides you with a free trial upon signup. Not only is that a great incentive for you to sign up, but the form also only requires you to enter an email address and password to do so, making the registration process even more enticing. The company has a box next to their form with information that explains everything you will get out of your trial and experience with the product. Zillow has a CTA button at the top of their main landing page that opens a sign up form in a popup box. When the popup box appears, the background fades so you can easily focus on the form. Zillow also makes, sign up easy with the ability to connect to your Facebook or Google account to speed up the process. When you open Crazy Egg’s website, you immediately see a large, bold CTA button that says, “Show Me My Heatmap” — right away, there is an incentive for you to sign up. To receive your heatmap, all you have to do is complete one form field. And to further convince you that providing your information is a good idea, the form includes social proof at the top of the page reminding you that over 300,000 (and counting) other websites use Crazy Egg. Hulu’s lead generation form is minimalist in terms of design. With one of the only pops of color being the CTA, followed by some very straightforward form fields, the form is easy to follow and understand. This is important because it’s a multi-step form, meaning once you hit “Continue”, you are directed to another landing page with more form fields to complete. Hulu breaks up the form into multiple steps due to its length to make it appear less daunting. Broadcast2world’s lead generation form is located on a landing page that contains a video, a description about the reasons why you should sign up, and social proof. Located next to the form, there is even contact information so you can get in touch with someone at the company to discuss any of your questions or concerns prior to signing up. And if that’s not enough, Broadcast2world added a long-text entry field to the form where you can describe any questions or concerns. When you open LinkedIn’s website, you immediately see their lead generation form. In addition to sign up being free (as stated at the top of the form), registration only requires you to complete four fields. Lastly, LinkedIn makes sure you understand that you will be agreeing to all of their terms and conditions upon form submission. When you open the DIRECTV website and click on their “Get Started” CTA button, a lead generation form appears in a popup box, causing the background to dim. The form stops you from continuing onto the next field if you don’t provide accurate information or if you try skipping required fields. Since the form is on the longer side, DIRECTV chose to implement a multi-step form so the it looks shorter in length and easier to complete. When leads click on the Bounce Exchange “Get A Demo” CTA button on the company’s landing page, they are brought to another page dedicated to signing up. Both the form’s title and the CTA “Submit” button are bright, bold, and large. The titles of the form fields are placed in a unique location, inside of the fields instead of above or around them, which creates a clean and streamlined appearance. My Simple Show’s lead generation form appears in a popup window that dims the background and everything else around it. Sign up, which is free according to the form, is also made quick and easy because you can connect through your Facebook or Google account. Another way the form saves you time is by providing you with their password creation requirements in the form … because nobody likes sitting there trying password combination after combination. Lead generation forms have the potential to increase your conversions and create a great user experience on your website. With the key takeaways and tips mentioned above, and the help of a great form builder, you can craft an impactful lead generation form that works for your brand, business, and buyer personas in just minutes. Get started by picking a few tactics from these examples and try implementing them in your own forms to see what works and boosts your number of conversions!